The Iowa Caucus kicked off February with a whole lot of "didn't expect that," as the Democratic vote was nearly too close to call, Donald Trump could no longer describe himself as the epitome of winning, and Ben Carson left the event (and the state) to find a change of clothes. (OK, maybe Americans could have foreseen that last one.) Iowa's caucus was just the beginning, though, with the New Hampshire primary election arriving right on its heels on Tuesday. You can expect the Granite State's vote to be just as riveting, but you'll only get to experience the excitement if you know when's the right time to tune in to the election happenings. 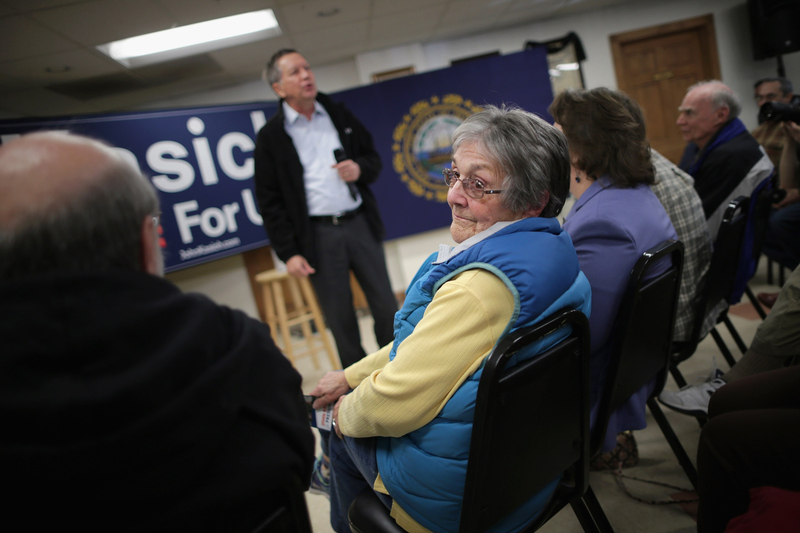 So what time does the New Hampshire primary start? Unlike a caucus, a primary election is an all-day event where voters can make the trips to their local polling stations at any point on Election Day. In New Hampshire, hours for polling stations vary, with some opening as early as 6 a.m. Typically, stations don't close until around 7 p.m., providing folks who work until 5 or 6 o'clock the chance to vote. So in contrast to last Monday's condensed version of events, where Iowans didn't begin their spirited teaming up for particular candidates until the evening, residents in New Hampshire won't be offering much in the way of entertainment when the voting is actually ongoing. But once the polls close and the counting begins, Americans across the country should perk up their ears a bit as the results are tallied. In the 2012 primary, projected results were announced within 30 minutes after polls had closed. If you haven't set your phone to blow up every time there's a breaking news alert, though, there will be opportunities aplenty to catch up on the latest results during your late night TV sesh. ABC News has scheduled coverage of the primary on Nightline, airing after Tuesday night's Jimmy Kimmel Live!. CNN's coverage will begin at 7 p.m. ET and is set to last until 2 a.m. And depending on your time zone, you could even find mention of the election results during your local nightly news casts. Even though there won't be several hours of folks scrambling to join the Ted Cruz side of the room, this definitely should not dissuade you from keeping a close eye on this primary. Americans could see totally different results from the Feb. 1 outcome in the Hawkeye State, since Iowa and New Hampshire have oftentimes gone their separate ways in choosing candidates for elections past. Bernie Sanders has held a double-digit lead over Hillary Clinton in New Hampshire polls, making a big victory a big possibility for the Vermont senator. On the Republican side, there exists a much wider gap between Trump's polling percentages and those of his opponents in New Hampshire than was the case in Iowa. So prepare yourself for a whole new ball game come Tuesday.